PIGGYBACKING… Give your event a lift! Piggybacking is a technique we use to boost attendance at existing festivals. By adding a 5K run/walk to an existing event you can potentially draw a larger audience, increase revenue and create more value for everyone involved. And the best part! We do most of the work for you! – We will take it from there! Want to generate more income with your existing event without increasing your workload? 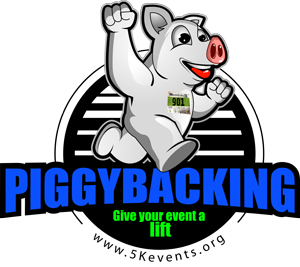 Consider piggybacking, a strategic practice created by 5Kevents.org to work with event planners. Piggybacking is where two or more events take place around the same time, at the same venue, sharing resources and leverage spending on event components such as permitting, restrooms, security, food and beverage, etc. Piggybacking enables planners to save money, increase attendance and reallocate funds into other areas. We can orchestrate a 5K where we manage the entire event or we can do things ala-cart. Research similar events taking place around you that may be the same time as yours, determine if there’s a good fit and then reach out to us and we’ll get started! We’ve piggybacked Beer Festivals, Oktoberfests, Reunions, corporate outings and more. There is no event too small or large that we can not accommodate.